Welcome to my second blog post. With Memorial Day in the rearview mirror, summer is finally here! The problem is that while I like to sit poolside in the evening and enjoy a glass or two of wine, most reds are simply too heavy and too high in alcohol to enjoy during our hot, humid summers in Cincinnati. However, I have the solution; the ideal red wine for summer. The fact that it is obscure, low in alcohol, affordable, and absolutely tasty only enhances its allure. About this time last year, Gayle and I attended a wineCRAFT tasting of small-production wines. When we arrived and picked-up the wine tasting information, our representative told us about a wine that was new to the Cincinnati market but was already a hit among wine people in New York; Domaine Nicolas Gonin, Persan Mondeuse 2013. I was unfamiliar with the region, IGP Isere-Balmes Dauphinoises, and I had never heard of either Persan or Mondeuse grapes. When he said that this was a red wine, I practically ran to get a taste of it. Needless to say, I was not disappointed! Isere is a tiny wine region located in eastern France, with Savoie to the north and the Rhone Valley to the south. This region once had more vineyard acreage than Beaujolais, but it was devastated by phylloxera during the late 1800’s. In addition, the growers in Isere failed to form an AOC after World War II. As a result, the viticulture there is tiny in comparison to what it once was; with about half of the grapes being grown for private production. Persan and Mondeuse, also known as Mondeuse noire, are both rare grapes. At one point, Persan was even thought to be extinct. As of 2012, there were only about twenty-two acres of it in production. It is a grape that is indigenous to Isere. Mondeuse is also native to Isere and to the neighboring Savoie. Although its popularity is on the rise, there were there were only about 500 acres in France planted to this variety in 2000. Both of these grapes are susceptible to powdery mildew and can be difficult to bring to full ripeness. Mondeuse is drought-sensitive, as well. Persan produces wine that is dark red, with acidity and tannic structure. It has flavors of red fruit, pomegranate, pepper, and spice; with floral overtones. Wine made from Mondeuse is typically purple, also with acidity and tannic structure. It has flavors of red fruit, plums, pepper, and spice; with some earthy, gamey overtones. Both of these grapes are known for their tartness. 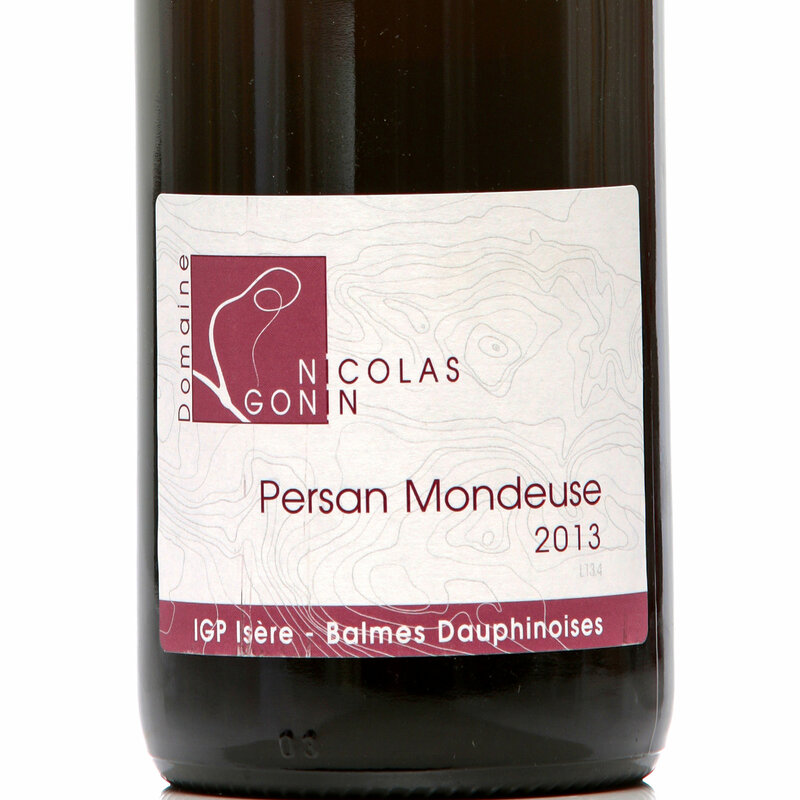 Domaine Nicolas Gonin, Persan Mondeuse 2013 is an organic, biodynamic blend of 40% Persan and 60% Mondeuse grapes. It is fermented with native yeasts. Fermentation and aging are done in enamel vats and the wine is bottled without filtration. This wine is deep garnet in color. The nose has an initial earthy aroma, which dissipates rather quickly, and lingering notes of plum and pepper. It opens with flavors of pomegranate, dried cranberry, plum and pepper. These flavors are carried through the mid-palate, with a medium to long finish of pepper and cranberry. This is a dry wine with good acidity and some tannic structure. As I indicated earlier, it has a remarkably low alcohol content of only 10%. Persan Mondeuse retails for $19.99 per bottle; limited availability. It is truly a pleasure to be able to offer a unique wine of this quality for less than twenty dollars.